Cardinals, with their striking scarlet plumage and black accents, are coveted guests for the avid bird-watcher. And one sure-fire way of attracting them into our backyard is pretty much what would lure us, too – food. These bright little birds love sunflower and safflower seeds, and feed well from trays, hoppers or platform feeders, since they prefer to perch while feeding. But picking out the right food is only part of the process – much thought needs to be put into selecting the right feeder for these birds, too. Let’s take a look at our picks for the best feeders for cardinals. This tube feeder, as the name suggests, is designed to keep squirrels at bay, while at the same time offering optimum incentives for birds to drop by, accommodating not just cardinals but also other charming little guests like white-breasted nuthatches, chickadees, purple finches and more. The tube can hold about three-quarter quarts of sunflower seeds – a favorite of cardinals – with an in-built seed ventilation system that prevents the tube from trapping hot, moist air which can then dampen and spoil the seeds. Keeping the food inside a tube also prevents debris like bird droppings getting into the mix. Fresher seeds, in turn, attract more birds, who can rest on the perches or hangers as they feed, accessing the food through openings at the bottom. To prevent squirrels and some bigger birds getting at the food, the feeder is equipped with a metal-mesh shroud designed to shut off access to the food if something of greater weight than the birds its designed for climbs on to it. The RoxResin material of the tube also has negative grip, so there is nothing for squirrels to hold on to if they attempt to access the seeds inside. This material also ensures the feeder is completely water-proof, rust- and weather-resistant, and perfectly safe to clean in a dishwasher. 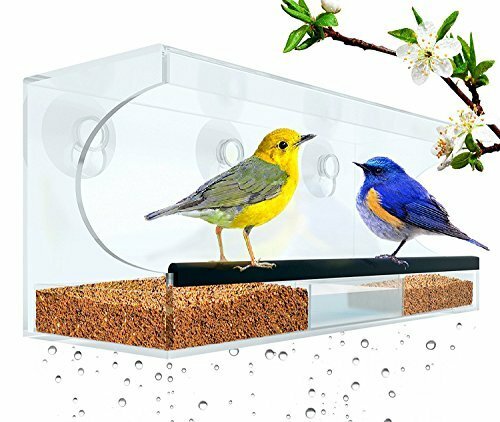 Get up close and personal with your feathery friends using this transparent window feeder, a cleverly designed contraption that is as simple as it is effective. 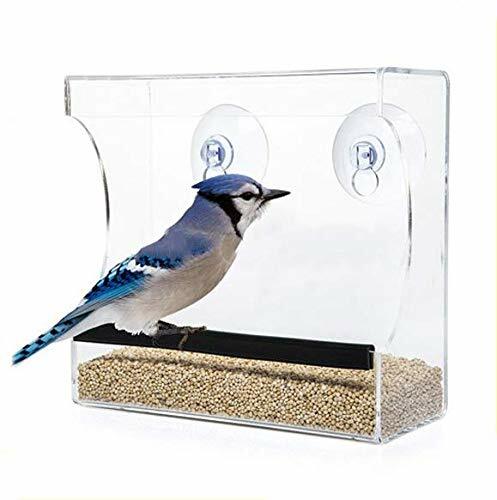 Powerful suction cups hold this feeder up against your window, the clear plastic not impeding daylight or your view as you get an enviable close-up of birds getting their fill of seeds. A little overhang prevents the wind or rain getting into the seeds, while the seed holder itself is deep enough to prevent spilling. A rubber strip at the lip of the holder offers a perch for cardinals and other birds to sit as they feed, though we recommend the larger size of the two available ones to accommodate slightly bigger birds. As the feeder does not come with any drainage holes, it needs to be cleaned out regularly and by hand, to ensure the seeds don’t wind up getting damp or becoming breeding grounds for bacteria or fungi. Cleaning is a simple process of giving the feeder a good scrub down with soap and warm water. Incredibly simple to set up and very enduring despite the lightweight design, this affordable feeder will bring you, your kids and your pets round-the-clock entertainment right at your windowsills. The tube feeder is all but self-adjusting, incredibly convenient and easy to use. A detachable lid at the top is all you need to remove to fill up the tube with birdseed – ideal for sunflower seeds and hearts – holding about 1.05 quarts at a go, so you don’t have to worry about constantly refilling it. The metal structure and UV resistant polycarbonate of the feeder is weather- and water-resistant, preventing moisture getting trapped inside, so the seeds stay fresh without getting clogged up or encouraging an uptick of bacteria or fungi. There is no hassle of assembly involved – the parts simply click apart when you need to clean it up, and snap back together without requiring any extra parts to fasten them in place. The two feeding ports come with spring-loaded perches, which automatically close under the pressure of the weight of bigger birds or rodents like squirrels or chipmunks, opening by themselves once that weight is lifted. This, along with the cylindrical, no-grip shape of the feeder, ensures squirrels and other rodents can’t get at the food inside, and is perfectly ideal for hosting cardinals and woodpeckers. Made of the best clear acrylic in the market, this charming little window feeder comes equipped with very durable suction cups to hold it in place, along with replacements to use once they wear down. The transparent feeder lets you enhance the view out of any window without blocking any of the light, and comes with a convenient, removable tray you can detach, fill up with food, clean down and replace with perfect ease. The tray also comes divided into three segments, so you can entice birds other than cardinals as well with different types of birdseed. The overhang prevents wind blowing the seeds off, keeps rain out of the food and can give birds some shelter if there’s a downpour, making for a charming little scene on rainy days. Furthermore, the feeder comes with drainage holes to let any moisture drip out, to keep the seeds fresh and preventing them clumping up. Both clinging and perching birds will enjoy this feeder, settling comfortably on the rubber landing strip that lets them settle and feed in peace. This feeder is also virtually squirrel-free, as sticking them halfway up the glass pane of a window prevents squirrels or other rodents from getting enough leverage to reach it. Trays are the easiest to clean, but are riskier when squirrels are involved, since they might filch the food you set out for your feathery visitors. Open trays also risk food getting wet or soiled, and if not regularly cleaned out, are counter-intuitive to attracting birds to come drop by, causing the food to spoil or become playgrounds for harmful microorganisms. Tube feeders are generally the most secure, since their metal reinforced structures are difficult for squirrels or rodents to get at or chew into. Tube feeders can be weight-sensitive, in-built with mechanisms which shut off access to the food if anything heavier than your average cardinal were to land on the perch. The best feeders of this kind also come with weather-resistant ventilation systems, to ensure the seeds don’t get damp or clogged up. If you’re opting for window feeders, options which come with non-spill holders, drainage holes and an overhang to protect the birdseed from the elements are all recommended. 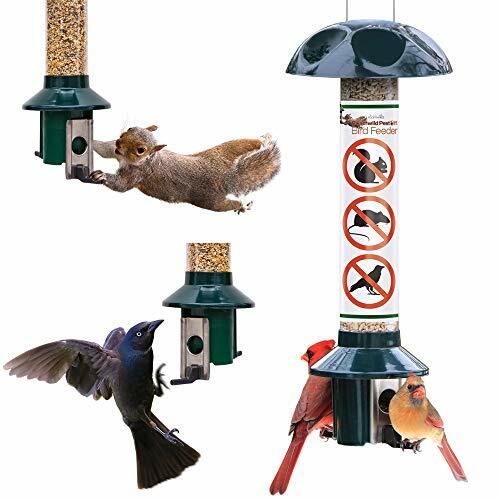 Strong suction cups that can hold the feeder in place – sturdy, clear feeders are recommended so you can watch the birds in action as they chow down – can suspend it just high enough up your windows to keep out of reach of squirrels as well.